The Lodge at Coille Bheag is an architect-designed semi-open plan luxury timber house, built to the latest energy-saving specifications for heating, lighting and insulation. 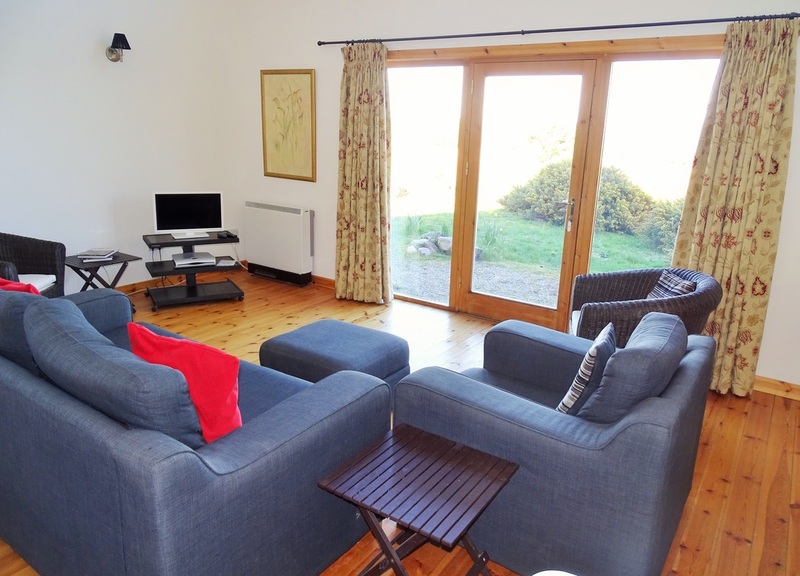 Like its sister property The Cottage, it commands beautiful panoramic views over Loch Ewe and the mountains of the Great Wilderness, Beinn Eighe and Sutherland, but is more spacious and offers Scandinavian-style modern comfort and luxury. The Lodge has ample parking and pedestrian access to the loch's pebble shore. Huge sandy beaches are within walking distance, or five minutes' drive. The Lodge is available all the year round and is ideal for a cosy winter holiday, family summer break or romantic getaway. It can comfortably accommodate up to four people in its two bedrooms - and there's a camp bed if you want to bring someone extra! 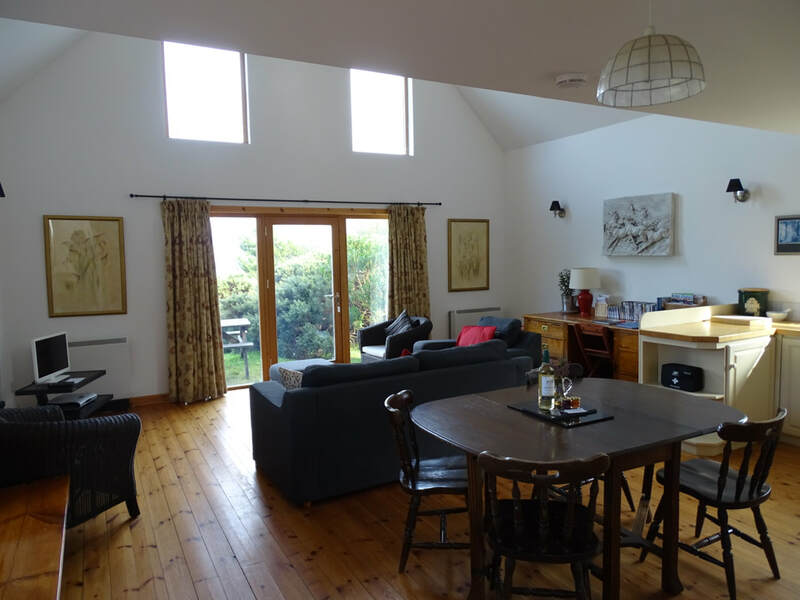 The large open-plan living area has a high cathedral ceiling, polished wooden floor and huge windows commanding spectacular views of Loch Ewe and the mountains beyond. There is satellite TV/radio and DVD/CD player as well as comfortable seating for four, a dining table and chairs and a writing desk with chair. Free wifi is available and a range of books, DVDs & CDs is also available for you to enjoy. The kitchen area adjoins the living area and is fully equipped with large butler sink and drainer, polished wood work surfaces, electric cooker, microwave, fridge/freezer, spacious cupboards, washing machine, toaster, kettle and ironing board/iron. All cookware, crockery, glassware and cutlery is provided. We also provide cooking oil, condiments, tea, coffee and sugar, shampoo and shower gel, the local paper, and a seasonal welcome pack including a bottle of wine and some home-grown or home-made produce from the croft. Depending on the season and the weather, we may also be able to sell you fresh produce from the croft, such as free-range eggs or vegetables from our surplus. Come for Christmas week, and we'll even decorate a free Christmas tree from our managed woodland to put you in the mood for celebrating! 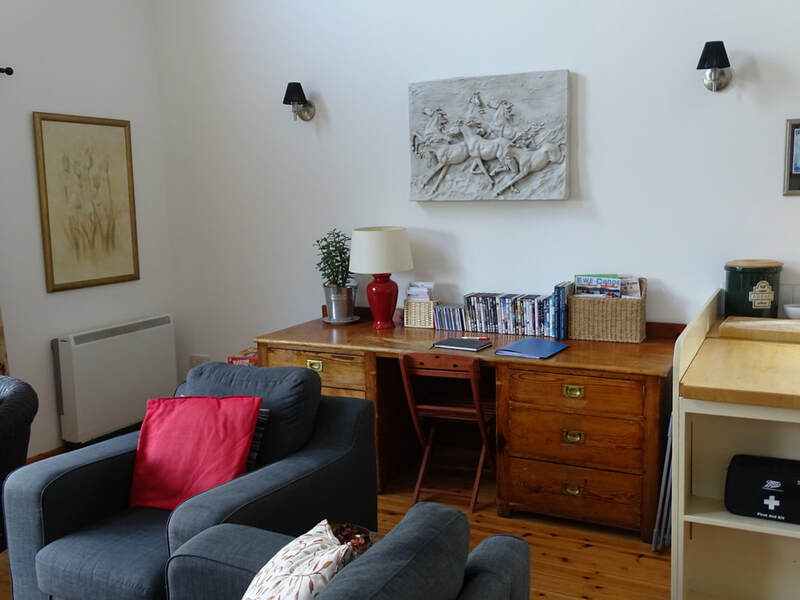 The main double bedroom is upstairs on the mezzanine level. It's a spacious, galleried area with a leather-upholstered king-size bed and double wardrobe, offering total privacy and overlooking the hills, meadows and woodland bordering Loch Ewe. The bed cannot be seen from the living area below. The smaller of the two bedrooms is on the ground floor, off the main living area and entirely private. It has twin single beds, although we can zip them together to form a king-size double bed on request - let us know when you book! The room commands its own views over the village of Inverasdale. The shower room is situated on the ground floor off the entrance hall, and features electric shower, heated towel rail, shaver point, washbasin and lavatory. A good stock of towels is provided! There is also a hall storage cupboard with space to hang your outdoor clothes.